As sanctions continue to take their toll on Russia’s faltering economy and salaries shrink in real terms, an increasing number of Russians are finding themselves unable to make ends meet. 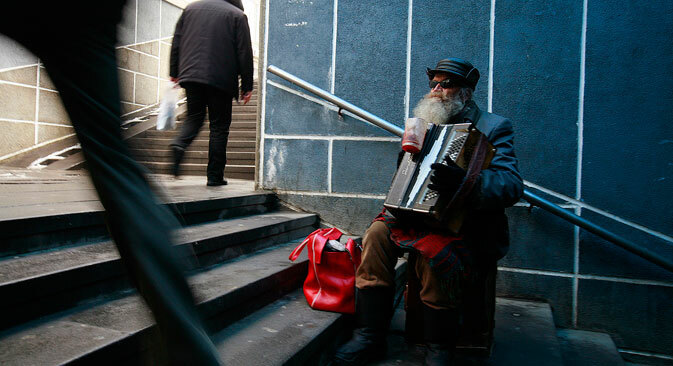 Data published by Russia’s state statistics bureau Rosstat indicates that 11 percent of Russians were living below the poverty line in 2014, but experts have called the veracity of these figures into question. As Russia’s economy continues to slide into recession under the effect of Western sanctions and falling relative incomes, figures published by Russia’s state statistics bureau Rosstat show that 16 million people, or 11 percent of the population, found themselves below the poverty line in 2014. However, Russian experts claim that this figure is far too low: The Rosstat statistics are merely the official data, which analysts traditionally see as unreliable. They warn that the official figures underestimate the problem and that in 2015 almost one in five Russians may find themselves in dire financial straits. “Official” poverty comes when incomes fall below the minimum subsistence level. Today, the minimum is 8,000 rubles a month ($150) per person. “Until recently, the number of poor in the country had been steadily declining since 2000. Even during the last crisis [in 2008] there was no significant increase in the number of poor,” said Kiselyova. But with wages and incomes shrinking, and most of this money going to cover food costs, housing and communal services, and other priority needs, there is no money left for other expenses, such as loan payments. “Today we are seeing an increase in the number of second and third loans that are taken out to service previously taken loans,” said Kiselyova. According to Sergei Smirnov, director of the Institute of Social Policy at the Higher School of Economics in Moscow, people are slipping into poverty faster than Rosstat thinks. This year, as a result of the sanctions, consumer prices have increased by 20 percent on average. If Smirnov’s forecasts are correct, it is possible that by the end of the year one Russian in eight will be living from paycheck to paycheck. A specific feature of Russian poverty is that it is often those who work who are the most affected. “The salary level of many people is close to the subsistence level or slightly above,” said Kiselyova. According to official statistics, this is the case for 13 percent of Russian workers. What has changed during the current crisis is that today's poor are not only people with social problems. According to public opinion surveys carried out in late March-early April 2015, the number of Russians who see themselves as poor has increased by 25-30 percent, he said. The statistics presented in the annual report by Ella Pamfilova, Russia’s human rights ombudsman, for example, are even more alarming: According to the Public Opinion Foundation, 47 percent of the population consider themselves “the working poor.” “It's hard to give up what you used to have, so people feel they have become much poorer, even if this is not quite the case,” explained Byzov. So what steps is the Kremlin taking to combat rising poverty in Russia? When asked about the measures being taken by the government, the press service of Russia’s Ministry of Labor and Social Protection reminded RBTH that insurance pensions have been indexed by 11.4 percent (averaging 13,000 rubles, or $241 monthly), welfare payments by 10.3 percent, and benefits for families with children and monthly payments for certain categories of citizens by 5.5 percent. In turn, on May 23 Russian President Vladimir Putin authorized the use of the state allowance paid for the birth of a second child as mortgage fee payments, as an additional measure to support families. According to Smirnov, it is decisions such as these that the officials are counting on, giving the example of plans being considered by the Ministry of Finance to avoid indexing pensions to the rate of inflation: “The State Duma has come up with an initiative not to pay pensions to working pensioners whose annual income is above one million rubles [$18,500],” he warned.